Have you ever watched Time Team on TV and wondered just what happens after they’ve made a discovery ? Have you ever watched Bones and been puzzled about the science behind the show ? Have you ever wanted to know what has made Durham City such a rich and diverse place in the country’s history ? Well, there’s a new exhibition on at the Durham Cathedral Palace Library that will not only answer a lot of those questions, but will inform, entertain and leave you in awe of the science and history behind an amazing discovery. Bodies of Evidence is the stunning new experience which charts the history of a group of Scottish soldiers, captured by Oliver Cromwell and marched from Dunbar in the Scottish borders all the way to Durham Cathedral. Not only are we taken through the timeline of their march, what they ate, where their slept, how many actually made it alive, but perhaps even more fascinating we are also shown what happened to some of them afterwards and where they ended up. First is the story of how the soldiers were discovered. From the initial uncovering of the remains (which were exposed during work to renovate the café), an archaeological investigation was set up to establish exactly who they were and to tie them into known history. These Scottish soldiers were captured at the Battle of Dunbar in 1650 and, after a period of incarceration, marched down the 110 miles to Durham where they were held in the Cathedral. Most of these soldiers were taken from small farmsteads in Scotland by generals loyal to King Charles and forced to fight Cromwell’s armies all across the borders. Many were the younger sons (the older ones being kept on the farm to continue working the land) and as such there were often ‘Sliding Door’ moments separating families simply by letting one son leave and one stay. Professor Chris Gerrard, Durham University Department of Archaeology has led this fascinating exploration and brought to life their stories. The next part investigates what happened to those soldiers who survived the march and imprisonment – soldiers were sent to work in linen factories on Tyneside, down to Lincolnshire to dig clearing ditches for the Fens, over to France to support English troops and, perhaps most amazing, over to the East Coast of the US to clear forests and work the land for the early settlers. Bearing in mind that this was the late 1600’s, this would have been an amazing wrench for the young Scottish men and yet they didn’t just survive, they thrived. It is estimated that there are now over 500,000 people in Eastern US who are descendants of the initial Scottish soldiers and here visitors are treated to videos from some of the families who have been traced. 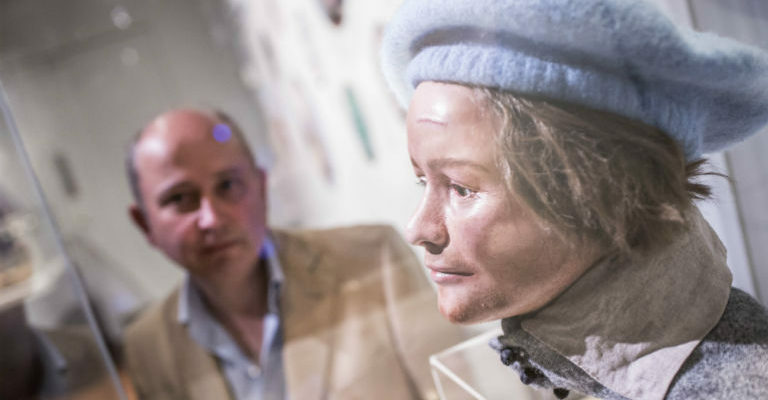 The 3rd part takes visitors through the science behind understanding the anthropology of the remains, who they were, what they ate, how they lived as well as an amazing facial reconstruction of one of the soldiers. Created and reconstructed by Prof Charlotte Roberts, one of the world’s leading palaeopathologists, bioarchaeologist and an expert in understanding people’s interactions with their environment, this is no dry science lesson; Charlotte’s displays bring to life the painstaking steps taken to providing understanding of our ancestors, our evolution and how lifestyle and environment change how we develop, our health and ultimately our demise. Bodies of Evidence is a wonderful walk through the history and science and is perfect for the casual visitor as well as the passionate history buff and will definitely leave you wanting to learn more. It will be revered throughout the UK and beyond as a pivotal display of how to blend 3 branches of human science and create a seamless understanding of cause and effect.